Installing brick siding on a large portion of your home might be better left to professional brick masons. Brick siding installation can be very hard and dangerous work. Correcting a mistake you might make while installing brick siding can also be difficult, especially if it is not noticed until the following day. However, if you want to try installing brick siding on a small area of your home, or to create an accent with brick, there is no reason for you not to realize the enjoyment of doing your own brick siding installation. You do not need many tools or materials to install brick siding. 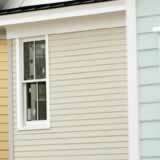 There is a short list of materials, especially if you are only doing a small area on your home. Lintels, to support the brick over window and door openings. Jointer, tool for putting a finish on the mortar joints. These tools and materials should enable you to begin your brick siding installation. If this is your first attempt at installing brick siding, take your time and inspect your work as you proceed. It is easier to correct a mistake before the mortar has dried. Brick veneer: Why do I have color variations? Brick: Is it Maintenance Free?